I don’t know about you guys but I love a bedroom tour. I’m super nosy and am constantly looking at interior designs (thank god for Pinterest!) 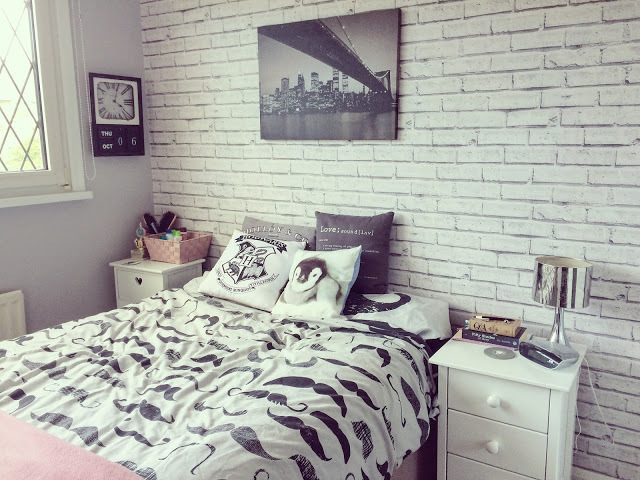 so I thought I’d jump on the bandwagon and make use of a bit of sunlight and show you a sneak peek at my own room! First up is my favourite place in the house: my bed. 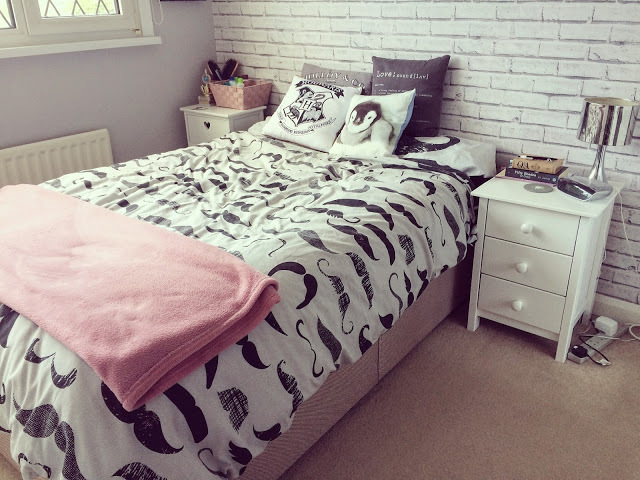 My room is all grey, black and white with touches of pale pink because as soon as I saw this blanket, I couldn’t resist it! I tend t buy my bedding and cushions from Primark, Asda and Matalan. I like to have a few options so I tend not to spend much money on bedding! Right now I have my moustache bedding on which is one of my favourites. I’m a bit of a cushion collector so I like to change my collection every couple of months. Right now we have a penguin and a Hogwarts crest but I’m thinking about buying a couple of Christmas ones soon! On my bedside table to the right are my go-tos. I try to keep this as clear as possible as there is nothing worse than a clogged-up bedside table. 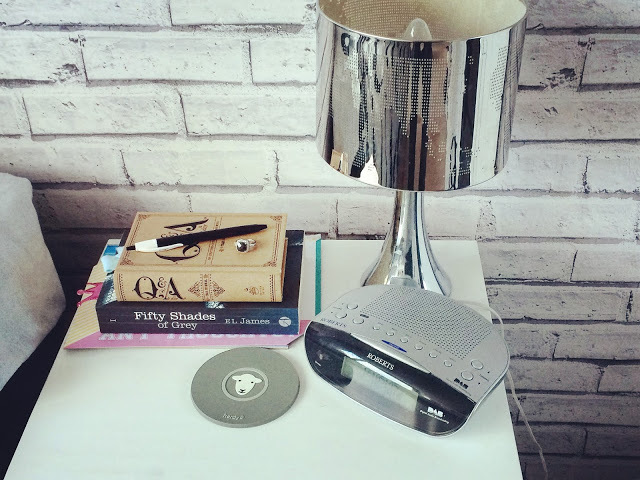 All I have is a lamp, my DAB radio, a coaster, a couple of books and a notepad with pen. I’ve been re-reading Fifty Shades of Grey before the new film comes out next year! I also love to write a to-do list every night and fill in my 5-year Q&A journal before bed. The only other additions are my phone and a bottle of water! This is the beauty side of my room. Here I keep all of my daily products in the bigger basket (deodorant, spray, moisturisers, eye make-up remover, face wipes, Vaseline) and all of my hairbrushes/combs in the smaller basket at the back. I also leave a coaster on this side for when friends come over for movie nights. Recently I was going through my memory box and found my old ballet trophy. I keep this out now to remind me that I have to work hard to be the best. Yes, I won it when I was six but I worked on that solo for about a year! Next is my gorgeous clock-come-calendar. My dad bought me this at Christmas because I kept nagging for a bugger clock. 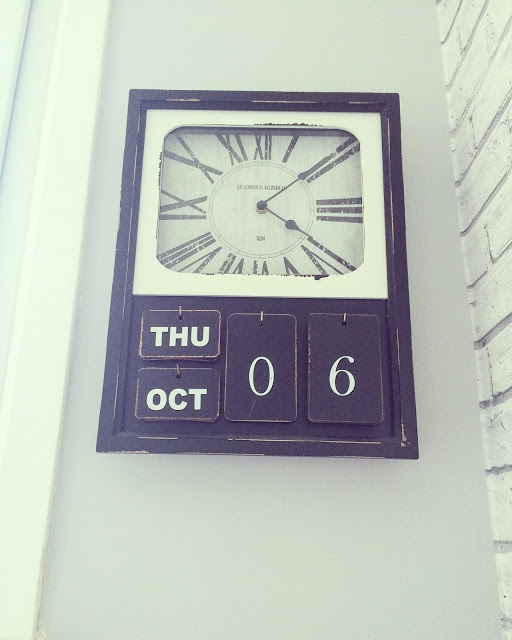 It’s a lot quieter than many clocks which I love and I always feel that a bedroom isn’t complete without one! I keep my mirror up here, just because I don’t like it directly pointing towards my bed! 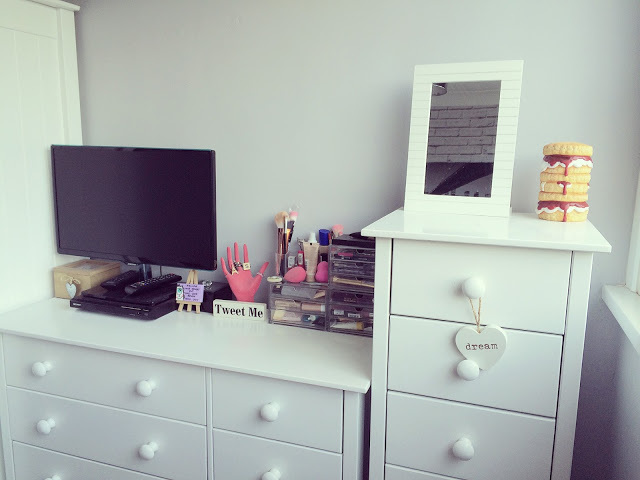 I bought this from Wilko after I’d bought all of my bedroom furniture because it matched my room! I also have this amazing money box that was a gift from my dad at Christmas. Every year, he buys me a couple of quirky or jokey presents and this was one of them last year. 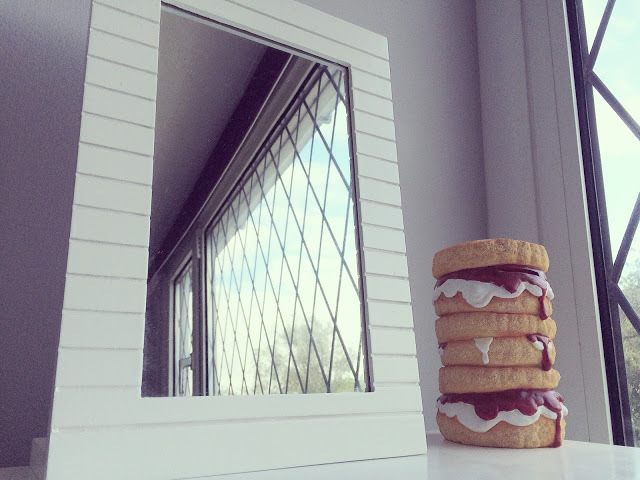 The thing is I don’t even like scones but I still think it looks cool! 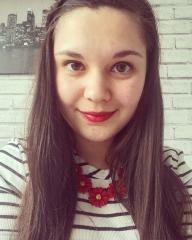 My ever-growing make-up collection! This is the stash of products that I use on a daily basis. I have a few make-up bags in my drawers stuffed full of unused products where I also keep all of my eyeshadow palettes. 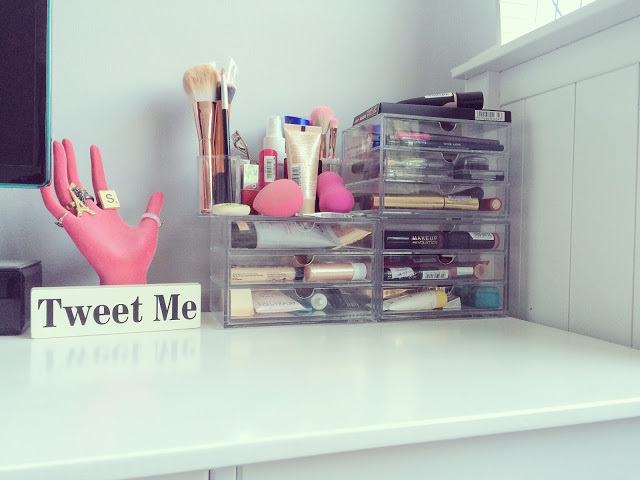 These clear drawers and brush holder were all bought on Amazon. I also bought this ‘Tweet Me’ sign a couple of years ago from a gift shop in Whitby because let’s face it, I’m a Twitter addict! 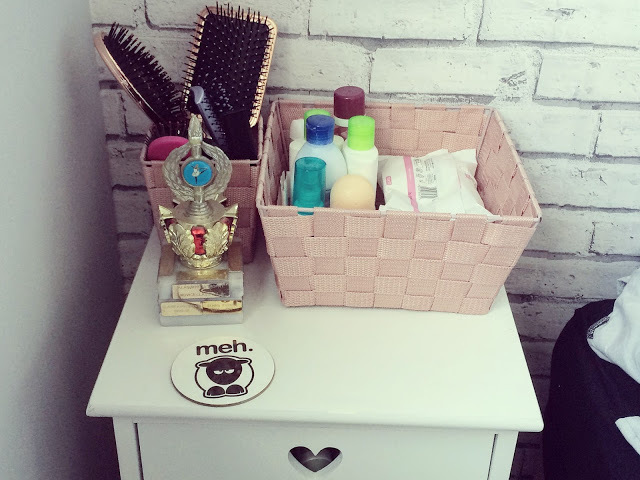 I love my pink ring holder too, another gift from Dad! 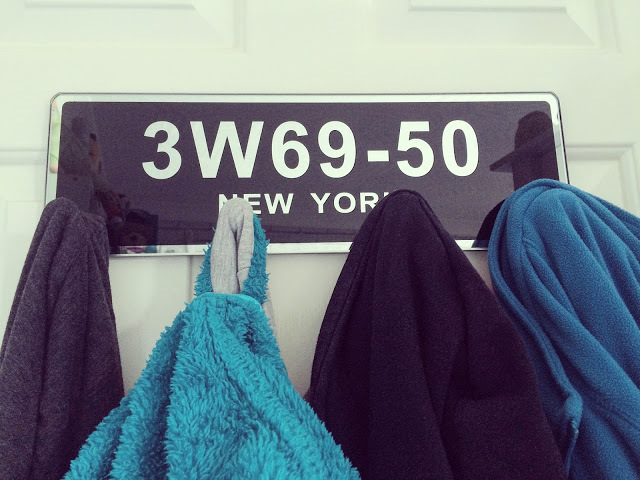 I’ve had this coat holder sign for years but have only had it up in the past couple of months. I basically stash all of my hoodies, dressing gowns and tote bags on here so I can just grab them and go! I love how expensive it looks even though it only cost about £10! And who doesn’t love New York? 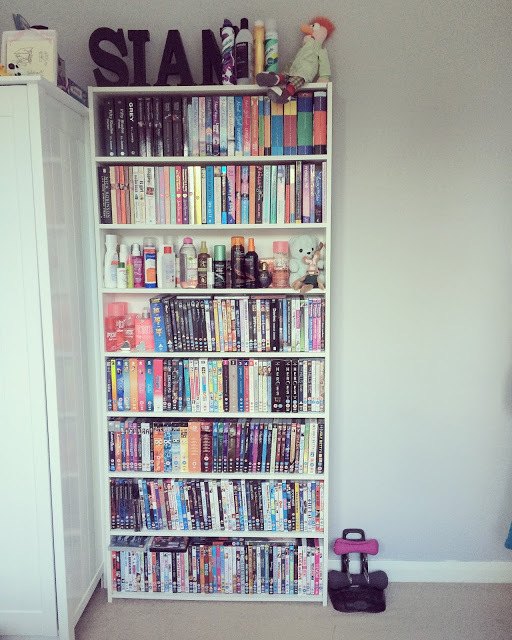 Finally is a look at my minimised book and DVD collection. Before we moved house about 18 months ago, I probably had about triple this collection. I decided to declutter pre-move and am so glad I did! 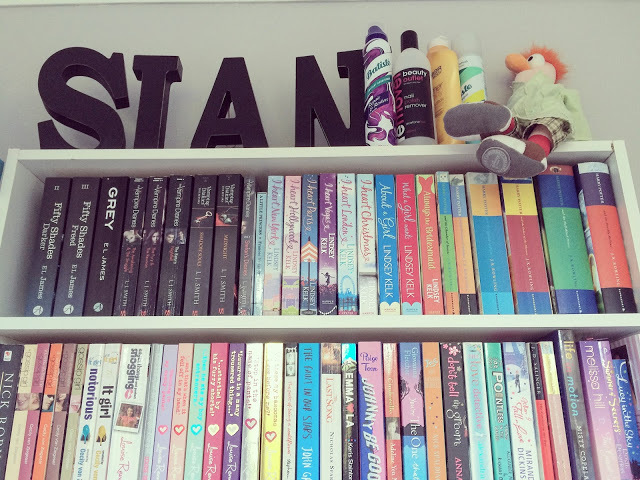 I have books stored on the first two shelves, spare beauty products and perfumes on shelf 3, dance/fitness/Harry Potter DVDs on shelf 4, TV box sets on shelves 5 & 6, musicals on shelf 7 and all other DVDs on the bottom shelf. I still have quite an extensive collection but there’s always room for a few more, right? I’m so grateful that my dad made me this bookcase because without it, I would still have boxes of stuff piled up here! I nagged and nagged at my dad to buy me these black letters for months so I was thrilled to get them as a present for my birthday in January! I did want to hang them on the wall but they were too heavy. Instead, I thought they would look best up there next to Beaker from The Muppets! So there you have it; my room may not be all white and Instagram-y but for me, it’s my relaxation zone and all white just wouldn’t be me! Have you done a room tour? Leave me a comment below!